A new drug to treat type II diabetes: Thank the…Gila monster? Earlier this week Lyxumia (generic name Lixisenatide), a new drug that helps to control type II diabetes, was launched in the UK. In addition to being an effective and saft therapy for type II diabeted, including in some patients that do not respond to current first-line therapies, Lyxumia is relatively inexpensive when compared to current therapies for type II diabetes, which will help to save the health services money that can be invested in other therapies. Lyxumia belongs to a new class of drugs known as the glucagon-like peptide 1 receptor agonists that work by increasing the secretion of insulin in response to consumption of food, and is administered by a once daily injection.That animal research played a key role in the development of the glucagon-like peptide 1 (GLP-1) receptor agonists for treating diabetes should not be a surprise, but when I took a quick look at the paper (1) reporting the preclinical development of Lyxumia (them called ZP10A) I got a surprise. The low half-life of native GLP-1 (90-120 s) (Deacon et al., 1995; Egan et al., 2003) has led to extensive research to find new compounds with pharmakokinetic properties suitable for development of a drug candidate. 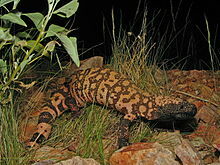 Exendin-4 was first isolated from the salivary gland of the Gila monster (Heloderma suspectum), and characterization showed that the peptide was structurally related to, but distinct from GLP-1 with a sequence homology of only 52%. Further characterization of exendin-4 showed that the peptide is a potent agonist for the mammalian GLP-1 receptor with a longer in vivo half-life and prolonged duration of action compared with GLP-1 (Raufman et al., 1992; Young et al., 1999). Recent studies have shown that administration of exendin-4 induces pancreatic endocrine differentiation, islet proliferation and an increase in β-cell mass (Edvell and Lindström, 1999; Xu et al., 1999), indicating that exendin-4 may exert insulinotropic effects on the β-cells (Greig et al., 1999; Parkes et al., 2001). Yes, you read it correctly, the development of effective GLP-1 receptor agonists started with a discovery made by a scientist studying venom peptides found in the the saliva of a large lizard! This should actually not come as so much of a surprise, venom is an incredibly rich source of bioactive molecules, and scientists around the world are studying the venom of a bewildering array of animals in order to identify everything from better painkillers to therapies for Parkinson’s disease. Recently EU recognized the value of such research by setting up the VENOMICS project to provide tools and resources to the scientists engaged in it. [T]hese studies demonstrate that ZP10A is an effective antidiabetic compound that effectively improves FBG and glucose tolerance, resulting in a long-term improvement of total glucose control. Furthermore, the sustained effect on glucose metabolism, and pancreatic expression of insulin even after discontinuation of ZP10A treatment indicates that ZP10A preserves β-cell function in diabetic db/db mice. Therefore, it is concluded that ZP10A is not only a promising candidate for the treatment of human type 2 diabetes but also it has the potential to prevent the progression of the disease. On the basis of these very promising results ZP10A underwent further preclinical evaluation in collaboration with Sanofi-Aventis before entering into successful clinical trials. The availability of a new and cost effective therapy to help people to manage type-2 diabetes is very welcome, but the story of the development of the Glucagon-like peptide 1 receptor agonists reminds us that new therapies can lurk in the most unlikely – and indeed most unpleasant – places! 1) Thorkildsen C, Neve S, Larsen BD, Meier E, Petersen JS. “Glucagon-like peptide 1 receptor agonist ZP10A increases insulin mRNA expression and prevents diabetic progression in db/db mice.” J Pharmacol Exp Ther. 2003 Nov;307(2):490-6. Epub 2003 Sep 15. Posted on May 2, 2013 May 2, 2013 by EditorPosted in News, Science NewsTagged db/db mouse, diabetes, Gila monster, glucagon-like peptide 1 receptor agonist, Lyxumia, mouse, Type II diabetes, Venom.